Sometimes you see a real-life car that catches your eye. Realistically, you know that its practical to assume you’ll never own the car, but, what if you could obtain a piece of that car–a piece of what that car represents. As a Hot Wheels collector of 20 years, this is sometimes the reasoning behind buying certain castings. As a young automobile aficionado, I can remember seeing the Dodge Sidewinder Concept at the 1998 Greater Milwaukee Auto Show. This show car stood out beyond everything else at that show as it was in the height of what I call the mini-truck craze–there was a section of a local classic car show dedicated to this car truck culture–this truck represented all that was cool about the late ’90s. This 2-seat convertible sports car was a light truck with attitude. I can even remember the real Dodge Sidewinder’s tires with laser cut flames serving as the treads. I could only imagine how cool it would be to drive this king of mini trucks that featured a 10-cylinder Dodger Viper engine…the pinnacle of cool, to a 15-year-old that was soon to get his license. The Dodge Sidewinder Concept unfortunately never got produced. Fortunately, Hot Wheels cured my need for owning a piece of this vehicle. Shortly after seeing the Sidewinder at the auto show, it was unveiled as a 1998 First Edition and was instantly snatched up by local collectors. The lore wore off eventually–not after I naively paid $5 for one at a local show–as this release was plentiful. Still, I was happy to own an embodiment of this concept car. 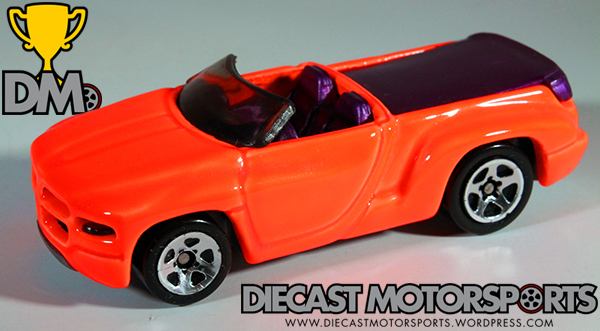 Hot Wheels produced the Dodge Sidewinder from 1998 to 2009, inserting it into some awkward series and lines, featuring some less-than-appealing graphics. Furthermore, the 1998 First Editions release remains the best reiteration of the Sidewinder to this day and brings back memories from when I first saw it at that auto show. Enjoy the Dodge Sidewinder! RELEASE DETAILS: Fluorescent Orange Body (metal). Tinted Windows. Dark Purple Interior. Chrome 5-Spoke (5SP) Wheels. Gray Base (plastic). Made in Malaysia. Toy# 18174. Released in 1998 as part of the 1998 First Editions.